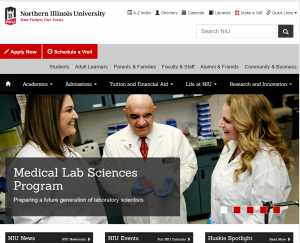 In case you missed it, niu.edu featured the Medical Laboratory Sciences program, interviewing Professor Masih Shokrani and MLS seniors Nicole Dispensa and Reilly Steidle. For two NIU students, discovering medical laboratory science (MLS) was the right degree path for them was like conducting lab research. “I was doing research and stumbled across the MLS program by accident, and I’ve been on that track ever since,” said Nicole Dispensa, a senior from Stillman Valley, Ill.
For Reilly Steidle, a senior from Naperville, Ill., the path to MLS began after trying to discover the cause of her own illness. Weakened by a mysterious illness, Steidle considering leaving NIU. Then she got word the Mayo Clinic in Rochester, Minn., would take her case. After many weeks of testing, she learned her diagnosis: Lyme disease. The care she received turned her thoughts to a science career. “I knew the lab would be the best fit for me because I could still make an impact on patients’ lives, but I could do it behind-the-scenes,” Dispensa said. Dispensa and Steidle happened to be in the right place to make their career dreams reality: NIU. Preparing a future generation of laboratory scientists with the knowledge, skills and professional attitude necessary to be a leader in the field is the college’s priority, said Masih Shokrani, associate professor of NIU’s Medical Laboratory Sciences program. Along with providing research opportunities, NIU prepares students for internships in other labs and advocates for their placement. Dispensa and Steidle learned that firsthand. They, along with three other classmates, landed prestigious internships at Mayo Clinic. Stiedle said she knew about the internships at Mayo before she selected MLS as her major. “I thought ‘this is exactly what I want to do. I want this so bad,” Steidle said. Her internship included creating blood products for patients at the clinic. “I thought it was cool to get that assignment. I did something I never would have done at a hospital,” she added. Shokrani said the fact that NIU students have earned internships at Mayo Clinic and others is a testament to the Huskie program. Dispensa and Steidle both graduate in May. Steidle aspires to return to Mayo Clinic, and to one day conduct Lyme disease research. “I want to put my name on a product that’s more than 50 percent effective in treating Lyme disease,” Steidle said. Dispensa will begin a master’s degree program to become a pathologists’ assistant. She will always be a Huskie. “I have certainly grown as a person and as a leader while attending NIU,” Dispensa said. “I feel like this was where I was meant to go and I don’t think I would have been as successful had I attended another school.